Can Taking B-Complex Vitamins Boost Your Energy? Can B-Complex Vitamins Boost Your Energy? B-complex vitamins are a family of water-soluble vitamins that include thiamine (vitamin B1), riboflavin (vitamin B2), niacin (vitamin B3), pantothenic acid (vitamin B5), pyridoxine (vitamin B6), folate (vitamin B9), and cobalamin (vitamin B12). Each of the B vitamins has a slightly different function but, as a group, they are primarily tasked with converting the foods you eat into energy. If you eat a reasonably balanced diet, you're probably getting all of the B vitamins you need. Deficiencies in the United States are relatively uncommon unless you are malnourished or suffering from disorders such as pernicious anemia, inflammatory bowel disease (IBD), or autoimmune diseases like lupus or Grave's disease. If a deficiency is diagnosed, an inexpensive B-complex supplement will usually set your right. However, in recent years, some supplements manufacturer have suggested that B vitamin can enhance your metabolic output and provide you a much-needed boost of energy if you are overworked or fatigued. The assumption seems fair given that increased metabolism (the conversion of calories and oxygen to energy) suggests a greater energy output. If you're looking for B-complex supplement to make you feel alert and motivated, you're probably going to be disappointed. While it's true that your body needs the B-complex vitamins to produce energy from the foods you eat—not only for muscles but for brain and nerve function— they can only do so much. Energy ultimately comes from the foods you eat, most notably carbohydrates and, to a lesser degree, proteins and fats. B-complex vitamins only serve as a catalyst to convert those calories into energy, much as in the same way that a match ignites the fuel in charcoal. More "matches" cannot create more energy if there is not enough fuel to burn in the first place. That's not to say that vitamin supplements won't make you feel better if you are nutritionally deficient. If you have been diagnosed with pernicious anemia, for example (the type caused by vitamin B12 deficiency), an injected or oral dose of vitamin B-12 will help improve your red blood cell count and alleviate symptoms of fatigue. Despite what some people may tell you, B-complex vitamins don't function like caffeine or natural pep pills. Even though energy drinks manufacturers will often boast about the high content of B vitamins in their products, having them does nothing to boost your actual energy. Moreover, once the body has all of the B vitamins that it needs for the day, the rest will be excreted in urine. They are not stored or accelerate the overall speed of metabolism. If you experience a boost of energy after drinking an energy drink, take a look at the product label. More likely than not, you'll find caffeine as one of the main ingredients. Despite having other ingredients marketed as "healthy" or beneficial, energy drinks ultimately lift your energy levels in the same way as a cup of coffee. According to Consumer Reports, well-known brands of energy drinks contain anywhere from 71 milligrams of caffeine per can to as much as 242 milligrams. By comparison, four single espressos deliver 252 milligrams of caffeine, and few people ever dream of drinking that much in one sitting. 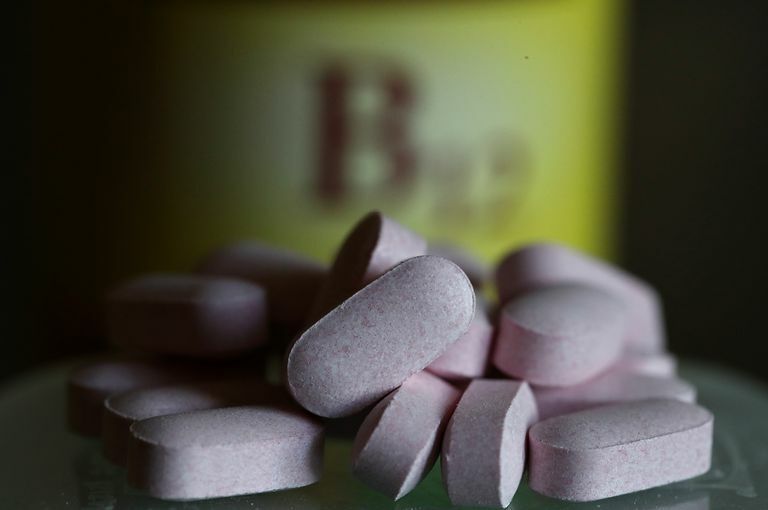 Unless you have an actual deficiency, are pregnant, or are about to become pregnant, there is really no really no reason to take a B-complex supplement. If you are suffering from low energy, start by looking at your lifestyle and make changes that can improve your overall health. Obesity, lack of exercise, poor diet, and emotional problems (such as depression) can all affect your energy levels and overall sense of well-being. Before turning to supplements, ensure that you are eating plenty of colorful fruits and vegetables, whole grains, and healthy fats (such as omega-3 fatty acids found in fish and monounsaturated fats found in nuts, seeds, avocado, and olive oil). Choose healthier protein sources, including lean beef and pork, skinless chicken and turkey, and vegetarian proteins like dried beans and soy products. High-sugar foods can cause your blood glucose to careen like a rollercoaster ride. Limiting your intake can help prevent the lows that invariably accompany the transient highs in energy levels. Regular exercise can also increase energy levels while stimulating the production of endorphins, improving your sense of well-being. Improved sleep hygiene and mind-body stress reduction can also go a long way toward restoring energy levels. Consumer Reports. The buzz on energy-drink caffeine. Published December 2012. Gropper SS, Smith JL, Groff JL. (2013) Advanced Nutrition and Human Metabolism (Sixth Edition). Belmont, California: Wadsworth Publishing Company.